We are fortunate that our manager encourages us to get training, and so…this week, we’ve had ‘levels of evidence’. In the past we have we have attended ‘Critical Appraisal Training’ and had the more specific ‘Literature Search Training’. There is an avid librarian community on Twitter, and for those of who can’t make it to conferences and away-days sharing what we learn via social media is key to helping ourselves and others develop within the profession. As we work in the NHS, there is definitely a trend of ‘doing more with less’ and we’re constantly brainstorming ways to raise our profile within the hospital but also keep our own work varied and interesting, we’re currently planning on a series of mini-videos to share on Twitter via @CEBIS to share our tips and tricks on searching with other information professionals. The aim is to make all librarians/information professionals feel empowered to do literature searching and to not view it a magical art that only a few can do. There have been many debates in our office as to whether something should belong in certain categories, we have regular arguments about if something is a ‘case series’ OR a cohort study. 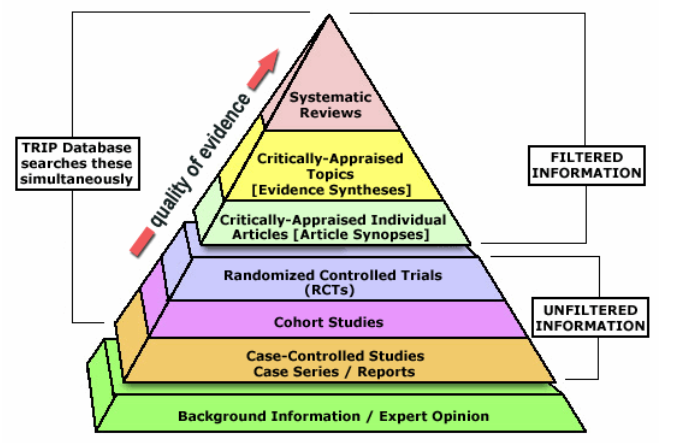 The top of the pyramid is inhabited by ‘systematic reviews’ but as we always like to say, your systematic review is only as good as what’s been reviewed and the rigorousness of the person (it should be people!) who did it. Equally, things like narrative reviews, editorials are at the very bottom but this is actually really misleading in our work. Sometimes, the qualitative information in an expert opinion can be incredibly more useful to a user than a systematic review that delves into studies that may be too much for someone looking for a summary on a topic. By the same definition when you’re looking at Random Trials, the title may sound great, but when you start looking at the details and it’s only 10 people or, it’s only been done over a few weeks…well it’s not something that you would want to include. Because sometimes, it really is hard to figure out and it’s a combination or practice but also just reading the article a couple of times. It is comforting to know that many academics have problems with exactly the same question. Janet Martin (Associate Professor, Department of Anesthesia & Perioperative Medicine and Department of Epidemiology & Biostatistics) plays ‘Name that Study! Do We need a new Category?’ with her students yearly. This is a big part of the work we do for our users, essentially taking a lot of the legwork out their ongoing research. Any research that is currently available on sound/acoustic therapy for tinnitus patients. We use a diverse group of databases but PubMed is usually the best place to start – especially if it’s a clinical question. PubMed allows you to set up your search to become increasingly more narrow and detailed but something like Trip can only use keywords and even then you will pick up a lot of studies/guidelines/policies that are usually irrelevant to what you’re looking for. NICE Evidence provides access to high quality authoritative evidence and best practice – especially useful when we’re searching for Guidelines. I know you’ll be surprised to see Google (in any form!) on that list but it’s sometimes the best place to start to scope out what is actually available on a topic. BY doing this, if you are struggling this will enable you to figure out what your search terms might be, as some questions can use phrases that haven’t been widely used. A most recent example is a question I’ve had on ‘The use of pabrinex and hydrocortisone in sepsis’ – pabrinex is a not a commonly indexed terms in any of the databases we look at so I had to find out what the components of it are. Turns out that pabrinex is primarily made up of thiamine and vitamin c (also known as ascorbic acid). Adding these phrases to my search string meant that I was able to find results but also relevant results for the user. This is the part of my job I enjoy – where you get to decipher your requests to find stuff!